Since declaring his presidential campaign in 2015, strong opposition to Donald Trump has existed, primarily from RINOs and those on the Left. Donald Trump has faced massive opposition from liberals and RINO Republicans alike, and even from the hierarchy of the Mormon Church who oppose a Border Wall. When polling organizations measure public opinion of political figures, they ask questions to determine how many people have a favorable or unfavorable opinion of the person. In general, politicians get elected because prospective voters' favorable ratings exceed the unfavorable ratings. A candidate's rating earns a boost from his nominating convention, and again during the transition between election day and taking office, as America tends to unite behind the winner. Every President experiences a decline in opinion polls as voters are turned off by unpopular decisions. Donald Trump is unusual because he was nationally well known before entering politics, and he has maintained a very high negative rating since his earliest opinion polls. The leading explanation for how Trump became President was that the Democratic candidate Hillary Clinton was even more unpopular with historically high negative ratings. 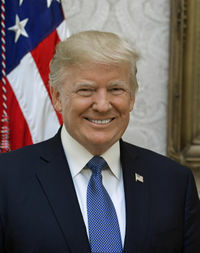 Due to his promotion and support of conservative, America First policies, President Trump faced large opposition from the left and the establishment, including from within the government bureaucracy. (The fact that members of the deep state have grown visibly scared of reports stating such confirms this view, as well as the fact that federal government employees overwhelmingly donated to Democrats leading up to the 2018 elections just like in previous elections; in May 2017, it was reported that 60% of National Security Council employees were Obama-Administration holdovers). In June 2018, one socialist protestor who heckled DHS Secretary Kirstjen Nielsen for her enforcement of President Trump's tough immigration policies was revealed as a DOJ employee. Even some White House officials worked against the president's agenda. Obama holdovers worked to block President Trump's agenda and continue liberal policies. Numerous government officials who resigned due to President Trump's actions subtly inserted anti-Trump messages into their resignation letters. The Trump Administration was the victim of numerous leaks of information, many of which threatened U.S. national security – it was reported in July 2017 that leaks occurred once a day on average, and Trump faced seven times more leaks than Obama or Bush II did. The Russia probe headed by Independent Counsel and former FBI Director Robert Mueller was founded to have hired investigators extremely biased against President Trump. Left-wing federal courts also blocked many Trump Administration actions, including President Trump's executive orders regarding sanctuary cities and immigration. Former U.S. presidents, such as George W. Bush and Barack Obama, even broke with tradition to criticize President Trump. Anti-Trump protest in February 2017 – "Not My Presidents' Day"
After his election, left-wingers labeled themselves as the "resistance" against Trump. Even before being inaugurated, Democrats spoke about impeaching and removing Trump from the presidency. Even some local communities passed resolutions calling for the impeachment of President Trump. Some Democrats used profane language against Trump, such as the f-word and s-word. As a testament to the deep opposition and hatred towards him by the left-wing, at least 217 violent protestors were arrested in Washington D.C. on Inauguration Day. Left-wingers committed or advocated for many other acts of violence against President Trump or his supporters. It was reported in early February 2017 that 12,000 tweets already had called for Trump's assassination. The mainstream media helped promote such violence, and top Democrat leaders encouraged it. Many entertainers made jokes about harming President Trump. Contrary to left-wing claims, Democrats and the Left were significantly more likely to engage in acts of bigotry or violence related to Trump, and they engaged in hate crime hoaxes. As an example of the hatred the Left had for President Trump, students at George Washington University voiced support for Trump's tax plan when told it was Bernie Sanders's plan. In fact, many liberals changed positions and opposed positions they formerly supported after President Trump also spoke in favor of those positions. Democrat attorney generals were extremely active against the Trump Administration, suing it nearly 50 times in 2017 alone. Leftists went out of their way searching for evidence of crimes by President Trump. In March 2018, Democrat Representative Tom Suozzi suggested taking up arms against President Trump. By June 2018, the Left was growing increasingly violent and unhinged at the Trump Administration, as well as everything they claimed to be fighting against. They used increasingly vulgar and crude phrases to criticize President Trump, including calling him and his supporters "Nazis." In a large August 2018 counterdemonstration ostensibly opposing racism, left-wing activists instead protested against President Trump, the police, and the existence or borders. In addition to the above, Senate Democrats unduly delayed Trump's cabinet nominees at historic and unprecedented proportions – by February 8, 2017, only George Washington had fewer cabinet nominees confirmed by this length of time into his presidency. Trump's last cabinet secretary was confirmed on April 27, 2017, and Trump's last cabinet-level member assumed office on May 15, 2017. It was reported in July 2017 that Senate Democrats had filibustered most of Trump's nominees – every filibuster ultimately failed, but they slowed down the confirmation process. The result of this was that by July 2017, the Senate had confirmed 23% of Trump's appointments compared to 69% for Obama at the same duration. Even after one year in office, only 58% of President Trump's government nominees had been confirmed (compared with 69% for Obama and 76% for Bush II), and Democrats had forced 47 cloture votes on Trump's nominees compared to six cloture votes for the four previous administrations combined by that point. In December 2017, the U.S. Senate, in a clear break from precedent, returned about 100 of Trump's nominations – rather than choosing to continue with those nominations for the following year – while it only did the same for eight of Obama's nominees and two of Bush's after their first years in office. Trump's presidency saw numerous heated confirmation battles. Democrats delayed the confirmations of President Trump's judicial nominees, and even red-state Democrats voted against them. The establishment GOP also blocked President Trump's conservative agenda. By the first 100 days of his presidency, congressional Democrats had already (unsuccessfully) filibustered Trump's supreme court nomination, instituted one of the longest and most extreme delays in cabinet confirmations in U.S. history, and initiated an investigation into alleged ties between the Trump campaign and Russia. According to Pew Research Center in July 2018, Facebook rants by Democrats expressing opposition, such as to Trump, increased by 450% after the 2016 election. As in the 2016 presidential election, the mainstream media strongly opposed Trump and wrote him off as a failure early in his presidency, despite his numerous accomplishments by that time. They consistently misrepresented him and his accomplishments, and they frequently attacked the president and his supporters. The mainstream media's bias against Trump promoted hatred, bigotry, and even violence against the administration. As evidence of this intense MSM opposition, a study published close to the 100th-day mark of Trump's presidency found that 89% of media coverage regarding Trump was negative. A similar study conducted by the Harvard Shorenstein Center on Media, Politics and Public Policy released in May 2017 found that 80% of the mainstream media coverage over Trump (including outlets such as Fox News Channel and The Wall Street Journal) was negative. According to the Pew Research Center, in October 2017, the media was three times more negative and eight times less positive toward Trump than it was to Obama, and the media was also significantly more biased against Trump compared to presidents Clinton and Bush II. The Media Research Center found that 90% of coverage on President Trump on the evening news of ABC, CBS, and NBC in 2017 was negative and biased against him, and it found in October 2018 that the level was at 92%. The MRC also found in October 2018 that 88% of media coverage of the GOP was negative. It found that media coverage of Trump in 2018 was 90% negative. Additionally, Trump was on track to become the most mocked president on late-night comedy TV in at least 25 years, and the Associated Press found in late 2018 that late-night hosts made more jokes about Trump than any other public figure in history. In July 2018, Jamelle Bouie, Slate's chief political correspondent, wrote that "for the better part of two years now, reporters have been trying to find the issue or offense that could fracture Donald Trump’s base of support." The American public had the same perception of media bias against the president – a June 2017 Rasmussen poll found that 50% of Americans believed the media was biased against President Trump and that 4% believed the opposite. According to a 2017 Poynter Media Trust Survey, 44% of Americans believe the media creates "fake news" stories against Trump to make him look bad. According to a Pew Research Center poll released in January 2018, the U.S. mainstream media was perceived by Americans as significantly more biased against President Trump than the media in other countries is against their own leaders. Even former president Jimmy Carter, a liberal Democrat, stated that the media was more biased against Trump than any other president he knew about. The mainstream media promoted fake news against President Trump, with notable examples including an unverified dossier by BuzzFeed, two stories by the The New York Times and CNN, respectively, debunked by former FBI Director James Comey, and an eventually-retracted CNN article that attacked Trump and his allies over a Russia fund that was motivated by ratings and caused three CNN employees to resign. President Trump and his policies caused the health of many members of the mainstream media to decline. The media tried to attribute some of Trump's achievements, such as the growing economy, to Obama, and it refused to give President Trump credit. In May and June 2018, the mainstream media exhibited blatant and even embarrassing bias against the Trump Administration when covering a certain illegal immigration-related incident, and it fabricated a non-existent "border crisis" – they did not refer to massive illegal migration levels when using the word "crisis" – in order to hurt President Trump and promote left-wing values. Although the media pressured President Trump to end the policy of separating illegal alien parents from their children (which had been occurring since before 2001), when Trump actually did this, they sided with Democrats and left-wing activists by going further and explicitly demanding open borders policies. The media refused to admit that mass levels of illegal immigration were a crisis. In August 2018, over 300 mainstream media outlets colluded to run op-eds on the same day to attack President Trump for not accepting their left-wing bias against him. Media coverage leading up to the midterm election was largely negative. Media FOIA requests at the Trump Administration EPA increased 669% from the last years of the Obama Administration. In the 2018 Presidents and Executive Politics Presidential Greatness Survey, 170 "experts" at presidential politics rated President Trump as the worst president in American history, ranking him even lower than presidents such as James Buchanan. By contrast, these "experts" rated Obama the eighth best president and second most worthy to be the next president on Mount Rushmore after FDR. According to a 2018 survey, 88% of Harvard professors thought Donald Trump did a "very poor" job as President while only 3% thought he was going a "good" or "okay" job. Liberals and establishment Republicans have compared President Trump's policies, such as those on illegal migration, to policies pursued by the Nazis or the Japanese internment camps during World War II. In addition to domestic opposition, President Trump, and by extension, the United States, was strongly opposed by non-Americans compared to the Obama Administration, despite a majority of non-Americans believing Trump to be a strong leader. Token conservatives have strongly opposed President Trump despite his many accomplishments in advancing conservative policies. According to a poll taken around the 100th day of Trump's presidency, only 11% of Democrats believed that their party's opposition to Trump had yielded successful results for them. A July 2017 poll found that 52% of Americans thought the Democrats only stood against Trump, rather than something more, with 37% thinking the latter. The Democrats' poor performance in the special congressional elections held in the first half of 2017 illustrated their weakness and unsuccess in challenging President Trump. President Trump's supporters also continued to support him despite left-wing predictions of "buyers' remorse." A poll taken shortly before the 100th day of Trump's presidency indicated that 96% of his supporters would have voted for him again had an election been held that day. A May 2017 poll showed Trump with 98% support among Republican military veterans and 54% overall. Similar polls taken mainly around the same time gave the same results. Additionally, a Pew Research poll indicated that over three-fourths of "white evangelical Protestants" approved of Trump's performance. These people, as well as members of the Tea Party Movement, did not believe the media and left-wingers in their war against President Trump. Evangelical Christians stood with President Trump, as seen in August 2017 when nearly every evangelical advisor to the president remained in their positions after Trump made politically incorrect comments related to white supremacism, while business and arts advisors resigned over the controversy and establishment Republicans criticized him. A POLITICO/Morning Consult poll taken just before the one-year anniversary of the 2016 presidential election found that 82% of Trump's voters would vote for him again. By one year into his presidency, Trump's base – as well as traditional conservative blue-collar Democrats – continued to strongly support him. By Trump's first year in office, his support among black people doubled despite claims of "racism" manufactured by the Left. According to a Gallup poll in June 2018, President Trump was seeing record support from Republicans, despite the Never Trump movement. Additionally, numerous polls found that he had higher approval ratings than several globalist world leaders. ↑ Scarborough, Rowan (December 9, 2018). 'Presidential harassment': Trump under unprecedented attack on multiple fronts. The Washington Times. Retrieved December 9, 2018. ↑ Bedard, Paul (March 19, 2017). Anti-Trump media: 91% coverage negative, 96% of donations to Hillary. Washington Examiner. Retrieved April 27, 2017. ↑ "Trump's Negative Image", gallup.com, January 30, 2016. Retrieved on June 22, 2017. ↑ "Fear of the "Greater of Two Evils" Could Spur High Turnout", gallup.com, August 3, 2016. Retrieved on June 22, 2017. ↑ Schoffstall, Joe (October 17, 2017). Federal government workers donating overwhelmingly to Democrats. Fox News (from The Washington Free Beacon). Retrieved October 17, 2017. Mikelionis, Lukas (June 21, 2018). DOJ employee among those heckling DHS boss Nielsen, report says. Fox News. Retrieved June 21, 2018. Samuels, Brett (June 21, 2018). Protester who interrupted DHS chief's dinner works for Justice Department. The Hill. Retrieved June 21, 2018. ↑ Pappas, Alex (August 23, 2017). Hiding secret anti-Trump messages in resignation letters is latest political craze. Fox News. Retrieved August 23, 2017. ↑ 2 Former Presidents Break With Tradition to Denounce Trump. Voice of America (from the Associated Press). October 21, 2017. Retrieved October 21, 2017. Jasper, William F. (November 17, 2018). ‘Indivisible’ Anti-Trump Strategy: Obstruct. Disrupt. Sabotage. Delay. Defame. Accuse. Investigate. Agitate. Impeach. The New American. Retrieved November 17, 2018. ↑ Pollak, Joel B. (May 17, 2017). In ‘Impeachment’ Talk, Washington Establishment Declares War on Trump Voters. Breitbart News. Retrieved May 20, 2017. ↑ McLaughlin, Seth (May 21, 2017). Local communities look for reasons, take up resolutions to impeach Trump. The Washington Times. Retrieved May 21, 2017. Hart, Angela (May 21, 2017). California Democrats flip off Donald Trump. The Sacramento Bee. Retrieved May 22, 2017. ↑ Yilek, Caitlin (June 4, 2017). CNN host calls Trump 'a piece of s--t' after London attack. Washington Examiner. Retrieved June 5, 2017. Shaw, Adam (June 17, 2017). Dem Strategist James Devine Launches Hashtag #HuntRepublicanCongressmen After Steve Scalise Shooting. Breitbart News. Retrieved June 18, 2017. Ernst, Douglas (June 15, 2017). HuffPo scrubs ‘ultimate punishment’ Trump piece after Scalise, GOP shooting. The Washington Times. Retrieved June 17, 2017. Nolte, John (July 5, 2018). Rap Sheet: ***613** Acts of Media-Approved Violence and Harassment Against Trump Supporters. Breitbart News. Retrieved October 24, 2018. ↑ Kirkwood, R. Cort (October 18, 2018). Anti-GOP Violence Escalates, Top Democrats Egg On the Goons. The New American. Retrieved October 18, 2018. ↑ Entertainers who have joked about harming Trump. Fox News. September 21, 2018. Retrieved September 21, 2018. ↑ Ciccotta, Tom (October 23, 2017). WATCH: Students Praise Trump’s Tax Plan When Told It’s Bernie Sanders’. Breitbart News. Retrieved October 23, 2017. Hawkins, Awr (March 19, 2018). Report: Democrat Rep. Suggests Taking Up Arms Against President Trump. Breitbart News. Retrieved March 19, 2018. Pappas, Alex (March 19, 2018). Democrat suggests 'Second Amendment' remedy vs. Trump. Fox News. Retrieved March 19, 2018. Manchester, Julia (March 19, 2018). Dem rep says Trump critics might resort to 'Second Amendment'. The Hill. Retrieved March 19, 2018. Adelmann, Bob (June 26, 2018). The War On Trump: From Confrontation to Harassment to … Violence? The New American. Retrieved June 26, 2018. Duke, Selwyn (July 6, 2018). Democrats Descending Into Dangerous Radicalism. The New American. Retrieved July 6, 2018. Murphy, James (October 10, 2018). Democrats Become Increasingly Combative as Thirst for Power Intensifies. The New American. Retrieved October 10, 2018. ↑ Nolte, John (July 4, 2018). My Declaration of Incivility: Media Call Us Nazis. Celebs Call Us C*nts. Dems Scream ‘F*ck You’. Breitbart News. Retrieved July 4, 2018. Sabes, Adam (August 12, 2018). 'Unite the Right' counterprotesters condemn racism, call for Trump's impeachment. The Washington Times. Retrieved August 12, 2018. Caplan, Joshua (August 12, 2018). Counter-Protester Threatens Woman Wearing ‘Trump 2020’ Shirt: ‘I’ll Break Your F*cking Face, B*tch!’ Breitbart News. Retrieved August 12, 2018. Caplan, Joshua (August 12, 2018). Counter-Protester Rages Against D.C. Police: ‘You’re All Ameri-KKK, Fascist Pieces of Sh*t!’ Breitbart News. Retrieved August 12, 2018. Binder, John (August 12, 2018). Watch – Antifa Chants Death to America: ‘No Borders! No Wall! No USA at All!’ Breitbart News. Retrieved August 12, 2018. ↑ Higgins, Sean (July 9, 2017). Senate Democrats filibustering most Trump nominees. Washington Examiner. Retrieved July 9, 2017. DeSilver, Drew (June 1, 2017). Trump’s nominees have already faced a large number of cloture votes. Pew Research Center. Retrieved March 10, 2018. Bedard, Paul (July 10, 2017). Senate stonewall: 23% Trump picks OK'd vs. 69% of Obama's. Washington Examiner. Retrieved July 10, 2017. Pappas, Alex (July 10, 2017). White House rips Democrats for 'needless obstruction' on Trump nominees. Fox News. Retrieved July 11, 2017. Harper, Jennifer (July 10, 2017). Just 23 percent have been confirmed: Obstruction of Trump nominees is unprecedented. The Washington Times. Retrieved July 11, 2017. ↑ Bedard, Paul (December 28, 2017). Just 58% of Trump nominees confirmed, 69% for Obama, 76% for Bush. Washington Examiner. Retrieved December 28, 2017. Bedard, Paul (December 19, 2017). Stonewall: 43% of Trump's picks held up in Senate. Washington Examiner. Retrieved December 19, 2017. ↑ Boyer, Dave (December 26, 2017). Trump having trouble appointing swamp-drainers. The Washington Times. Retrieved December 26, 2017. ↑ Restuccia, Andrew; Kim, Seung Min (December 22, 2017). Democrats block dozens of Trump nominees. Politico. Retrieved January 4, 2018. ↑ Shaw, Adam (May 3, 2018). Brutal confirmation process threatens to turn off would-be Trump picks. Fox News. May 3, 2018. Retrieved May 3, 2018. Swoyer, Alex (July 9, 2017). Senate Democrats hold blue slips, delay Trump’s federal judicial nominees. The Washington Times. Retrieved March 10, 2018. Kirby, Brendan (March 5, 2018). Dems Delay Trump’s Judicial Nominees by Running Out the Clock. LifeZette. Retrieved March 10, 2018. Jipping, Thomas (May 30, 2018). Democrat Obstruction in the Senate Is Hurting Our Courts. The Daily Signal. Retrieved November 15, 2018. Jipping, Thomas (June 22, 2018). In 2014, Democrats Were Perfectly Comfortable With the Pace of Confirmations. The Heritage Foundation. Retrieved November 15, 2018. Jipping, Thomas (July 5, 2018). The Democrats’ ‘Whatever Means Necessary’ Strategy. The Heritage Foundation. Retrieved November 15, 2018. ↑ Klukowski, Ken (August 21, 2018). Most Red-State Senate Democrats Voting Against Trump Judges. Breitbart News. Retrieved August 21, 2018. ↑ McLaughlin, Seth (April 27, 2017). Democrats seeking revenge prepare to mark 100 days of ‘resistance’. The Washington Times. Retrieved May 4, 2017. ↑ Bedard, Paul (July 18, 2018). Facebook attacks on Trump by Democrats up 450%. Washington Examiner. Retrieved July 18, 2018. ↑ Taking Sides on Facebook: How Congressional Outreach Changed Under President Trump. Pew Research Center. July 18, 2018. Retrieved July 18, 2018. ↑ Kurtz, Howard (April 3, 2017). Media score a triple-bogey presidency, but Trump is just getting started. Fox News. Retrieved April 3, 2017. Harper, Jennifer (March 2, 2017). Press coverage of Trump in first month of office: 88 percent 'hostile,' says new study. The Washington Times. Retrieved December 1, 2018. ↑ Miller, S.A. (April 30, 2017). President Trump criticizes ‘dishonest’ press in 100th-day interview. The Washington Times. Retrieved May 4, 2017. Mitchell, Amy; Gottfried, Jeffrey; Stocking, Galen; Matsa, Katerina Eva; Grieco, Elizabeth (October 2, 2017). 3. A comparison to early coverage of past administrations. Pew Research Center. Retrieved December 27, 2017. Kurtzleben, Danielle (October 2, 2017). Study: News Coverage Of Trump More Negative Than For Other Presidents. NPR. Retrieved December 1, 2018. Noyes, Rick (October 9, 2018). Study: Economic Boom Largely Ignored as TV's Trump Coverage Hits 92% Negative. NewsBusters. Retrieved December 1, 2018. Media Trump Hatred Shows In 92% Negative Coverage Of His Presidency: Study. Investor's Business Daily. October 10, 2018. Retrieved December 1, 2018. Morris, Michael (October 10, 2018). Trump Tweets: ‘Media Research Center Reports That 92% of Stories on Donald Trump Are Negative’. CNS News. Retrieved December 1, 2018. ↑ Harper, Jennifer (October 31, 2018). Strategically hostile: Broadcast news coverage of Republican Party now 88% negative. The Washington Times. Retrieved December 1, 2018. ↑ Fernandez, Marisa (November 9, 2018). Trump was joked about in late-night TV more than any public figure ever. Axios. Retrieved November 9, 2018. ↑ Caplan, Joshua (July 19, 2018). Slate’s Jamelle Bouie: Reporters on Mission to ‘Fracture Donald Trump’s Base’. Breitbart News. Retrieved July 21, 2018. ↑ Harper, Jennifer (June 22, 2017). Just 4 percent of Americans say the news media favors Trump: poll. The Washington Times. Mitchell, Amy; Simmons, Katie; Matsa, Katerina Eva; Silver, Laura (January 11, 2018). Publics Globally Want Unbiased News Coverage, but Are Divided on Whether Their News Media Deliver. Pew Research Center. Retrieved January 11, 2018. Rodriguez, Katherine (October 22, 2017). Jimmy Carter: ‘Media Have Been Harder on Trump’ More than Other Presidents. Breitbart News. Retrieved October 22, 2017. Jimmy Carter: Media tougher on Trump than any other president in memory. Fox News. October 22, 2017. Retrieved October 22, 2017. Heinlein, Peter (May 30, 2017). Trump Frustrated by 'Fake News' That Overlooks His Accomplishments. Voice of America. Retrieved June 26, 2017. Persons, Sally (June 27, 2017). Trump slams media after CNN retraction. The Washington Times. Retrieved June 27, 2017. Scarborough, Rowan (April 25, 2017). Ex-spy admits anti-Trump dossier unverified, blames Buzzfeed for publishing. The Washington Times. Retrieved June 27, 2017. Henderson, Barney; Lawler, David; Burke, Louise (January 12, 2017). Donald Trump attacks alleged Russian dossier as 'fake news' and slams Buzzfeed and CNN at press conference. The Telegraph. Retrieved June 27, 2017. Media firestorm over Trump-Russia dossier. Breitbart News. January 11, 2017. Retrieved June 27, 2017. Boyle, Matthew (January 24, 2017). Exclusive — Ex-BuzzFeed Reporter on BuzzFeed, CNN Fake News Dossier on Trump, Russia: ‘I Would Not Have Made That Decision to Run That’. Breitbart News. Retrieved June 27, 2017. Boyle, Matthew (June 23, 2017). Very Fake News: After Breitbart Investigation, CNN Retracts Conspiracy Theory Hit Piece Attacking Trump, Associates Over Russian Fund. Breitbart News. Retrieved June 24, 2017. Boyle, Matthew (June 24, 2017). CNN Under Fire: ‘Very Fake News’ Network Hit from All Sides as Breitbart Investigation Forces Rare Retraction. Breitbart News. Retrieved June 25, 2017. Spiering, Charlie (June 27, 2017). ‘FAKE NEWS!’ — Donald Trump Challenges CNN for ‘Phony Stories’. Breitbart News. Retrieved June 27, 2017. ↑ Richardson, Valerie (June 27, 2017). Trump charges ‘fake news’ after CNN producer admits ‘bulls–’ Russia story is about ‘ratings’. The Washington Times. Retrieved June 27, 2017. Boyle, Matthew (June 26, 2017). Three Employees Resign from CNN Amid Very Fake News Scandal. Breitbart News. Retrieved June 27, 2017. Adams, Becket (June 26, 2017). Three CNN staffers quit over retracted story. Washington Examiner. Retrieved June 27, 2017. ↑ Scarry, Eddie (September 22, 2017). The media are on the brink of a nervous breakdown. Washington Examiner. Retrieved September 22, 2017. ↑ Nolte, John (June 25, 2018). Nolte: Border Hysteria Delivers Disastrous Week for Establishment Media. Breitbart News. Retrieved June 25, 2018. ↑ Nolte, John (June 23, 2018). Nolte: Six Reasons Establishment Media Fabricated a ‘Border Crisis’. Breitbart News. Retrieved June 23, 2018. ↑ Wegmann, Philip (June 22, 2018). Those heart-rending stories at the border keep falling apart. Washington Examiner. Retrieved June 22, 2018. ↑ Binder, John (June 21, 2018). Court Records: Feds Have Separated Illegal Alien Families Since Before 2001. Breitbart News. Retrieved June 21, 2018. Shaw, Adam (June 21, 2018). Trump immigration order met with shrugs and new demands from Dems: 'This isn't over'. Fox News. Retrieved June 21, 2018. Flood, Brian (June 21, 2018). Anti-Trump media moves goal posts after executive order in 'shameful' display of bias. Fox News. Retrieved June 21, 2018. Dinan, Stephen; Boyer, Dave (July 1, 2018). After Trump yields on family separation, immigration activists demand end to detentions, ICE. The Washington Times. Retrieved July 2, 2018. ↑ Gainor, Dan (March 27, 2019). Dan Gainor: Press was wrong on Mueller, just like it was wrong on the border. Fox News. Retrieved March 27, 2019. Nolte, John (August 13, 2018). Nolte: 128 Establishment News Outlets Coordinate Attack on Trump. Breitbart News. Retrieved August 13, 2018. Duke, Selwyn (August 14, 2018). Media Collusion: 100-plus Papers Agree to Simultaneously Run Anti-Trump Editorials. The New American. Retrieved August 14, 2018. Singman, Brooke (August 16, 2018). Trump accuses The Boston Globe of ‘COLLUSION’ with other papers as hundreds run editorials against him. Fox News. Retrieved August 16, 2018. Kirkwood, R. Cort (August 17, 2018). Newspapers Throw Tantrum; Trump Responds. The New American. Retrieved August 17, 2018. Flood, Brian (August 15, 2018). Coordinated anti-Trump editorials 'sure to backfire,' critic warns. Fox News. Retrieved August 15, 2018. ↑ Jasper, William F. (November 30, 2018). Midterms: How Much Did the Partisan Fake News & Tech Giants Aid Democrats? The New American. Retrieved December 1, 2018. ↑ Moran, Sean (March 20, 2019). Establishment Media Increase Trump EPA Document Requests 669% over Obama Requests. Breitbart News. Retrieved March 21, 2019. ↑ Scher, Brent (March 20, 2019). Media FOIA Requests to EPA Spiked After Trump Election, Data Reveal. The Washington Free Beacon. Retrieved March 21, 2019. ↑ 97.0 97.1 Savransky, Rebecca (February 19, 2018). Trump takes last spot in experts' presidential rankings survey. The Hill. Retrieved February 19, 2018. ↑ Pandey, Erica (February 19, 2018). Experts rank Trump as worst president, Obama 8th best. Axios. Retrieved February 19, 2018. ↑ Williams, Thomas D. (May 3, 2018). Eighty-Eight Percent of Harvard Faculty Say Trump Has Done a ‘Very Poor’ Job as President. Breitbart News. Retrieved May 3, 2018. ↑ Pollak, Joel B. (June 18, 2018). Pollak: Trump-Hating Beltway Pundits Insult Jews by Invoking Holocaust to Criticize Border Enforcement. Breitbart News. Retrieved June 18, 2018. ↑ Hudson, Jerome (June 18, 2018). Celebs Melt Down over Border Enforcement: ‘Nazis,’ ‘F**king Kidnappers,’ ‘Torturing of Children’. Breitbart News. Retrieved June 18, 2018. ↑ Nolte, John (June 18, 2018). Laura Bush Compares Border Enforcement to ‘Japanese American Internment Camps’. Breitbart News. Retrieved June 18, 2018. ↑ Harper, Jennifer (April 30, 2017). Inside the Beltway: Only 11% of Democratic voters say opposition to White House is a success. The Washington Times. Retrieved May 4, 2017. ↑ Kew, Ben (July 17, 2017). Poll: Over Half Americans Think Democratic Party Stands for Nothing but Opposing Trump. Breitbart News. Retrieved July 18, 2017. ↑ Pollak, Joel B. (April 23, 2017). Poll: 96% of Trump Supporters Would Vote for Him Again, Win Popular Vote. Breitbart News. Retrieved April 24, 2017. ↑ Harper, Jennifer (May 29, 2017). 98 percent of Republican military veterans approve of Trump: Poll. The Washington Times. Retrieved May 29, 2017. ↑ McLaughlin, Seth (May 28, 2017). Virtually no buyer’s remorse among Trump voters. The Washington Times. Retrieved May 28, 2017. ↑ Smith, Gregory A. (April 26, 2017). Among white evangelicals, regular churchgoers are the most supportive of Trump. Pew Research Center. Retrieved May 13, 2017. ↑ Leahy, Michael Patrick (May 17, 2017). Tea Party Activists: Media Attacks on President Trump ‘An All Out Assault on Our Republic’. Breitbart News. Retrieved May 20, 2017. Greenwood, Max (August 18, 2017). Member of Trump's Evangelical Advisory Board resigns over 'conflict in values'. The Hill. Retrieved August 19, 2017. Chiacu, Doina; Lynch, Sarah N. (August 20, 2017). Prominent U.S. religious conservatives defend Trump after Charlottesville. Reuters. Retrieved August 20, 2017. No regrets: Trump backers say they'd vote for him again, one year after election. Fox News. November 9, 2017. Retrieved November 9, 2017. Shepard, Steven (November 9, 2017). Trump voters: We'd do it again. Politico. Retrieved November 9, 2017. ↑ In the Heart of Trump Country, His Base’s Faith is Unshaken. Breitbart News (from the Associated Press). December 27, 2017. Retrieved December 28, 2017. ↑ Munro, Neil (January 14, 2018). Donald Trump’s Support Among Blacks Has Doubled Since 2016, Amid Racism Claims. Breitbart News. Retrieved January 15, 2018. ↑ Nolte, John (June 26, 2018). Never Trump Fail: President Enjoys Record Support from Republicans. Breitbart News. Retrieved June 26, 2018. This page was last modified on 20 April 2019, at 18:03. This page has been accessed 31,262 times.